Friend and photographer, Carla Kimball, documented progress I made in creating When the Moon Came to Earth, a piece for Woodstock, Vermont’s Sculpture Fest. Click to see her first installment and second installment of photographs. These images are from the “Hands on Pianos” project I am currently participating in. 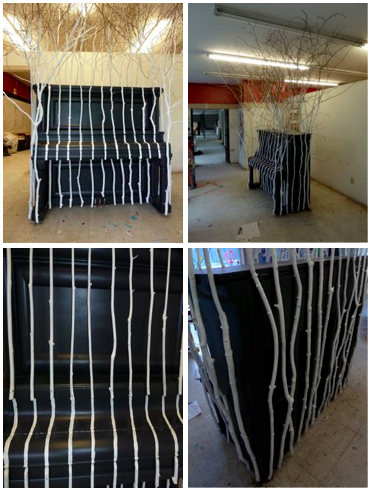 This piece is called “Tree Songs.” It’s comprised of saplings I painted white and screwed to a piano I painted black. 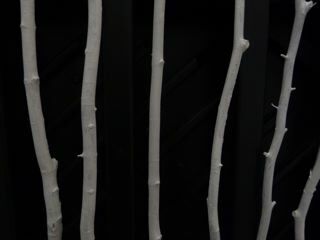 By attaching saplings to the piano, it appears to have the forest reclaim it, or perhaps people will see the piano as growing among a bunch of saplings. There is a beautiful rhythm to a grove of saplings clustered in a forest. The repetition of these vertical elements should compliment the black and white keys of the piano. The piece will be installed for the month of July in an outside, public space somewhere in Vermont and New Hampshire’s Upper Valley. This project is part of Dartmouth College’s celebration of the Hopkins Center for the Arts’ 50th anniversary. Mine is one of 50 pianos that have been altered by artists that will installed in the region. See more images of the creative process on the official Hands on Pianos website. And find pianos using this map of all installations. I’ll let you know when I learn where my piece will be installed.